A center-stage for fascinating talks from trendsetting to tech-savvy, knowledge thirsty and liberty-focused international audience from Bulgaria and the world. 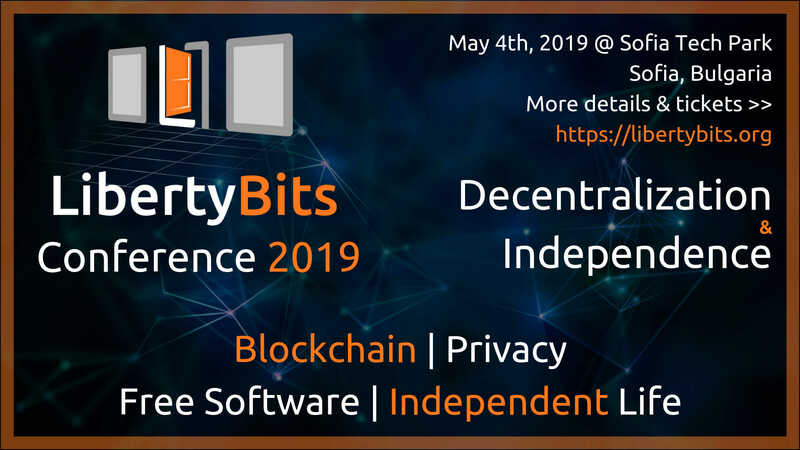 The conference will meet the search of “hungry” (young) people with a demand of cutting-edge blockchain projects, privacy, free software and independent living innovators in order to deliver outstanding and inspiring talks about our present and near future, making the world a better and safer place to live. What is the actual and future application of distributed (open) ledgers, a.k.a. blockchain technology? What is the purpose of cryptocurrencies and how much value is in there? What exactly is cryptomining, why to care about it and is it worth it? How to improve our private and business communications protection and why? How secure and private are commercial servers (a.k.a. the Cloud)? Why free software is essential for privacy as well as for freedom? What are the alternative energy sources and how can they improve our live? How can we take steps to cut off the wire to common energy providers and continue to live off-the-grid? Dr. Richard Stallman launched the free software movement in 1983 and started the development of the GNU operating system (see www.gnu.org) in 1984. He has received the ACM Grace Hopper Award and the ACM Software and Systems Award, a MacArthur Foundation fellowship, the Electronic Frontier Foundation’s Pioneer Award, and the the Takeda Award for Social/Economic Betterment, as well as several doctorates honoris causa, and has been inducted into the Internet Hall of Fame. Hernâni Marques is Computational Lingust, Sociologist and Neuroinformatician, board member and activist of the Chaos Computer Club Switzerland (CCC-CH) and council member of the p≡p foundation, helping in creating tools to restore privacy and engaged in fights for privacy, freedom of speech and information. Liz is the CEO/Managing Director of Least Authority in Berlin, a company supporting people’s right to privacy through security consulting and building secure solutions. Prior, she managed financing for Internet freedom projects at the Open Technology Fund. Evgeniya is the founder of 1Legal.Net and describes herself as an Internet Law explorer & practitioner, blockchain lawyer, IP protection strategist, web enthusiast, inspired speaker, blogger maniac, life hacker, and an incurable optimist. She truly believes that to be a nerd today is the lesser evil than to be a technophobe. Asen Kovachev is a visionary and founder of the Automaton project; a peer-to-peer network for scalable, standardized protocols. Asen believes permissionless innovation in the blockchain space will challenge the centralized status quo, and is critical in restoring the liberty of individuals to own and utilize their information. Dr. Nana Karlstetter is working on structures and functionalities for sustainable transformation. She develops and manages projects mostly in the fields of digital security/free software and resilience/climate change. She works for the p≡p Foundation (Winterthur, Switzerland) and is a founding member of the new p≡p Coop. She was head of the production of the Logan CIJ Symposium 2016 in Berlin. Vassil is a Legal consultant @ 1Legal.Net and a Blockchain law explorer, techno enthusiast, social networks maniac, crypto legal issues investigator, media content contributor. He believes that legal issues cannot be reduced to black or white. Nikola has been actively involved in the blockchain and cryptocurrency space for the past 5 years, educating diverse audiences on the benefits and risks of the technology. His current projects include Moneyfold, a licensed UK financial company offering national currencies on the blockchain and Sofia Blockchain Capital, a company that invests in mining, ICO’s and other blockchain opportunities. Radoslav is a blockchain advocate and Product Owner at Propy. As such he is responsible for the product vision, direction, and development. His goal is to demystify blockchain technology for the public by finding the golden mean between consumer needs and good technical solutions. Nikolay is a Product Development Manager at Neterra – a pioneering telecom company and one of the first alternative Internet providers in Bulgaria. He is also a blockchain enthusiast and believes in its growing importance to decentralization, fintech and digital security. Technology and Innovation Network (T+IN) or “Sofia Tech Park” is the first science and technology park in Bulgaria designed and created to act as a platform for the exchange of knowledge and ideas between academia, business, government and society.